Dwarf lemon trees are improved Meyer lemons (Citrus meyeri). Because the tree is so small, reaching a height of 10 feet at the most, it is often simply called a "dwarf lemon" or "Chinese dwarf lemon," according to information published by Floridata. Dwarf lemon trees are not only popular for their small size, which allows them to be grown in containers, but also for their year-round attractiveness and prolific fruit production. Dwarf lemon trees can be grown outdoors only in United States Department of Agriculture (USDA) plant hardiness zones 8B through 10, according to information published by Floridata. In cooler zones, the tree can be grown in containers and brought indoors for the winter, or grown indoors year-round. Dwarf lemon trees are not suitable for tropical climates, however. Plant your dwarf lemon in loose, rich soil. The soil should be well-draining, according to information published by Oregon State University. To aid in drainage, amend heavy garden soil with peat moss, or for container trees, choose a potting soil formulated for citrus trees. 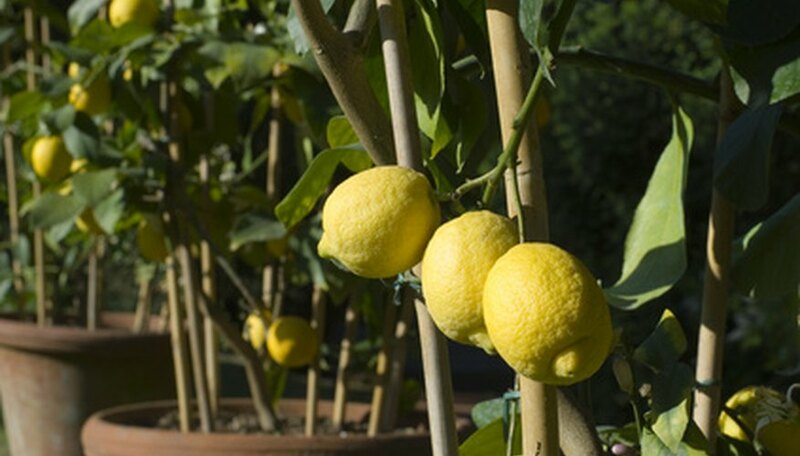 Plant the dwarf lemon with the top of the root ball slightly above the surface of the soil, then water thoroughly. Citrus trees in general need a lot of water, and the dwarf lemon is no exception. The soil should be consistently moist, according to information published by Oregon State University, but never soggy, which can lead to root rot. Test for dryness by inserting your finger into the soil. Water when the soil is dry down to 2 inches; 1 inch in spring, which is when the tree needs the most water. Fertilizer is very important for these trees. They are heavy feeders and should be fertilized at least once a month. Use a slow-release fertilizer formulated for citrus trees, or one that is acidic, and follow the directions for application on the label according to the sizes of your dwarf lemon. Dwarf lemon trees thrive in the sunlight. They need exposure to a minimum of eight hours of sunlight per day, and preferably 12, according to information published by Oregon State University. Place trees in containers outside during the summer if your climate allows for it so they can soak up the maximum amount of light.